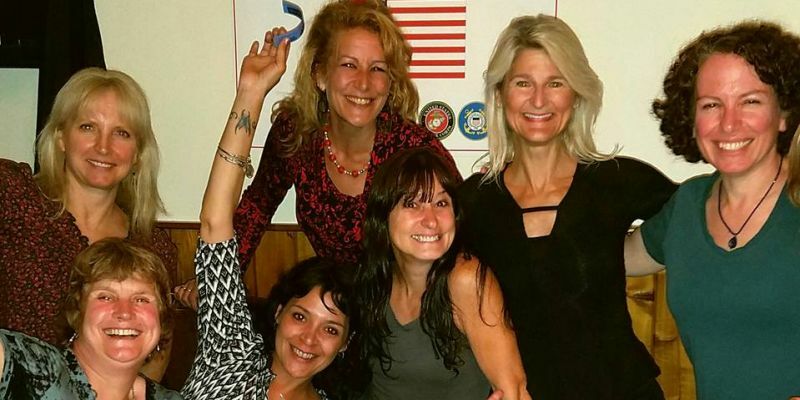 The Gardiner Day Committee will be hosting its annual Women Helping Women Dance to benefit the Washbourne House, a local women’s domestic violence shelter, on Friday, April 26 from 7-11pm at the VFW on Route 208 in New Paltz. DJ Jay Smooth will be playing music and the party will include door prizes, raffles and a discounted cash bar. The price per ticket is $20. Those with a last name starting with A-M are asked to bring an appetizer while those with names ending in N-Z are asked to bring a dessert. If you are interested in picking up a ticket, please contact Jewell Turner at 257-9675 ext.107 or Kathy DeLano at 255-4262 ext.4401. If you are a local business who would like to donate a prize or gift certificate to the raffles or door prizes please contact Jaynie Marie Aristeo at 389-1849. The evening promises lots of fun, good food and drink and the opportunity to contribute to a great cause. Pictured Above: A group of skydiving friends who come out to support the Women Helping Women Dance each year. Left to right: Karen Harding, Nickie Fegan-Friedman, Leslie Wayne, Jen Marosy Scura, Jaynie Marie Aristeo, Ingrid Pessa, Judy Diamond. Photo courtesy Jaynie Marie Aristeo.